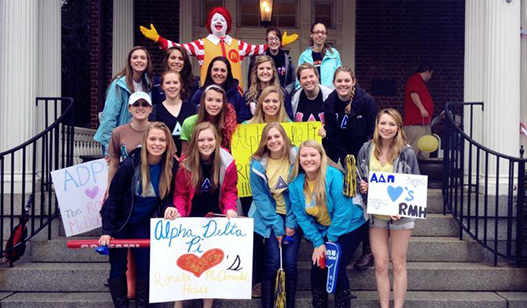 Alpha Delta Pi supports approximately 40% of RMHC’s chapters worldwide, leaving signifiant room to grow our support for the House that Love Built. Our goal is to reach $1,000,000 in the RMHC Endowment, and as of July 2018, we’re just over halfway there! And earmark the proceeds from your new event or increased fundraising for the RMHC Endowment Fund at the Alpha Delta Pi Foundation. In celebration of our 40th Anniversary as a philanthropic partner with Ronald McDonald House Charities (RMHC), the Alpha Delta Pi Foundation will make inaugural grants from the RMHC Endowment to benefit locations that are not currently well-supported by either a local Alpha Delta Pi collegiate chapter or alumnae association. Support from a local collegiate chapter or alumnae association does not disqualify applicants from receiving an inaugural grant. The deadline to apply is May 1, 2019. If you have questions about the RMHC Endowment or the application, please contact the Alpha Delta Pi Foundation at foundation@alphadeltapi.com or (404) 378-3164.